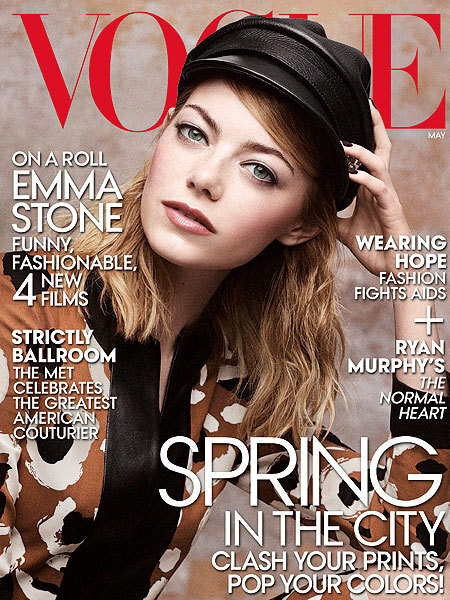 As Vogue's May cover girl, actress Emma Stone opens up about cute boyfriend and “Amazing Spider-Man 2” co-star Andrew Garfield. "I think I've learned a lot by being around him," the 25-year-old says of Garfield. "And, you know, he is an incredibly important person to me. It's been fun working with him just because of who he is as an actor and person. I think it would be fun no matter what." Garfield told Vogue about his ladylove, "I thank my lucky stars that we've been able to be on this ride together. We all need companions in the mystery to get you out of your head and into your heart, to moan to and to take the piss out of it all with." Read more of Stone’s interview at Vogue.com! Also, watch Emma in a new Vogue Original Short, written and directed by Ruben Fleischer and check out her best style moments!